11:30 pm (Thurs.) – 6:35 am (Fri.). Asleep. Again woke up warm, but was able to go back to sleep swiftly. A much better night’s sleep. 6:35 am. Up! Still have some mild bronchial what’s-it, but it’s mild. It’s no worse than yesterday. At present, my sense is that rest + vitamins are taking care of it. However, will monitor this today & see if doctor’s visit proves warranted. 7:10 – 7:30 am. Shoveling! Fortunately, not much snow had fallen since the previous night’s shoveling. 7:35 – 7:40 am. To campus. 7:45 – 8:00 am. Wrote the preceding, checked Facebook. 8:00 – 8:15 am. Added “Thursday” links to all blog posts (meant to do this last night). 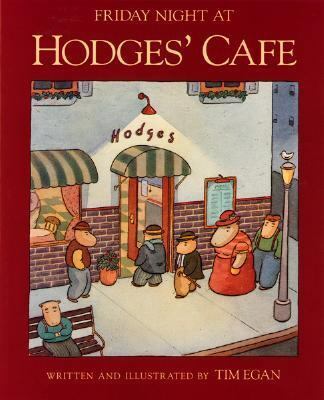 Decided on Tim Egan‘s Friday Night at Hodges’ Cafe for today’s image. Egan is one of the greatest and most underrated picture book creators working today. 8:15 – 8:25 am. Class prep for English 355. 8:25 – 8:35 am. Apparently, the Reading Matters newsletter was not done. Added two late entries. Also subtracted an entry that was supposed to have appeared on-line yesterday. It’s still not up this morning, and so we’ll save it until the next issue. 9:15 – 9:30 am. Via Leonard Marcus on Facebook, found these remembrances of Margaret K. McElderry. Logged on to Twitter & shared it, & discovered these remembrances of Janet Schulman. I exchanged a couple of emails with Ms. Schulman (re: The Annotated Cat), but never met her in person. Also, thanks to Bill Kartalopolous, came upon John Porcellino’s thoughtful comic in support of teachers. 9:30 – 10:10 am. Class prep for English 355. Also: Complete Barnaby email. Looks like our source for 200 Barnaby strips may in fact be a source for more like 400 Barnaby strips. Cushlamochree! 10:10 – 11:05 am. Class prep for English 703. Re-reading, refining questions. I suspect that students will find today’s essay (by David Rudd) challenging, but it’s important that they grasp it (it’s a smart piece). And we’re applying it to Anthony Browne’s Voices in the Park (1998), which is always such a pleasure to discuss. Also, during this time period, made a cup of that Throat Comfort Tea, and drank it. Really good stuff. 11:05 – 11:15 am. Thinking about English 703, expanded notes on Voices in the Park. 11:30 am – 12:20 pm. English 703 (Critical Approaches to Children’s Literature). 12:30 – 1:00 pm. Lunch. More Throat Comfort Tea. Re-reading Molly Bang’s Picture This for English 355. 1:00 – 1:15 pm. Responded to personal note via Facebook. Also checked in on Maria Nikolajeva’s blog — inspired by my idea, she has been doing the same thing this week. I have, in fact, checked in on her blog earlier in the week, but I think failed to note that I’ve done so. Also responded to FB comment re: this blog. 1:30 – 3:20 pm. Two sections of English 355 (Literature for Children). Inspired by Molly Bang, I give students four pieces of construction paper — white, black, orange, blue — and a pair of scissors. As she did when she visited us a few years back, I have them do two pictures — first of which is to create a scary picture featuring birds or fish. They’re not allowed to glue their images down. And they have exactly 5 minutes to create the image. We then have them put the pages in the middle of the room, while we gather around and discuss which pictures evokes fear well, how it (and others could be improved). It’s an effective way of getting people involved in reading pictures, and thinking about the choices that an artist makes. 3:30 – 4:40 pm. Went to hear novelist Philipp Meyer speak, on campus — part of the English Department’s Visiting Writers & Speakers series. 4:55 – 5:05 pm. Twitter, where I found The Oatmeal‘s The Likability of Angry Birds, which is the only video game (app game?) I play — though I haven’t found time for it this week (yet!). Natalie Cecire (ncecire) led me to ProfHacker‘s “We’re All Badgers Now: Weekend Edition” (Chronicle of Higher Ed), a good piece on the uprising in Wisconsin. 5:05 – 5:35 pm. Homeward bound, via the People’s Grocery. 5:40 – 6:40 pm. Reception for Philipp Meyer, at Dan and Sarah’s house. Had a nice chat with Mr. Meyer & others. Yes, I count both the reading and the reception as work — pleasurable work, of course! 6:40 – 6:50 pm. Logged in to FB, read blog post reporting that Gov. Walker was asked to leave a local restaurant because all the people booing him caused a disturbance. Also checked email, answered one from a student. And checked Twitter. 6:50 – 7:00 pm. Changed from professor get-up (slacks, jacket, tie) into civilian clothes (jeans, jersey, sweater) once more. 7:00- 8:40 pm. Read (to Karin) from Alan Bradley’s The Sweetness at the Bottom of the Pie. Dinner with Mad Men, Season 3, Episode 12 (22 Nov. 1963) — that inspired me to listen to Steinski‘s “The Motorcade Sped On” (1986), a mash-up of the Kennedy Assassination. Also watched Rachel Maddow Show, 8:04 – 8:40 pm. She does a great job. And Richard Engel does such incredible work (he was reporting from inside Libya tonight). 8:40 – 8:50 pm. Wrote the preceding entry. 8:50 – 9:15 pm. Listened to music, including the new Raphael Saadiq single, “Stone Rollin’,” & (thinking of Wisconsin) Dropkick Murphys’ “Worker’s Song” Meandered through FB. 9:15 – 9:30 pm. Worked on this blog entry — described the English 355 class. 9:30 – 9:40 pm. Listened to Robyn Hitchcock, Squeeze. 10:00 – 10:30 pm. Worked on “Radical Children’s Literature Now!” (the ChLA 2011 talk that Julia and I are doing). Wrote new paragraph. 10:30 – 10:37 pm. Cox Internet cut out, as it does from time to time. The unplugging-and-replugging-in method brought us back up on-line again. 10:37 – 10:50 pm. Listened to music — just discovered power-pop group The Orange Peels. Bought a few tracks off of their 2009 album 2020. Catchy! 10:50 – 11:05 pm. Edited The Purple Crayon and a Hole to Dig: The Lives of Crockett Johnson and Ruth Krauss. There’s a sentence from 1963 that’s been bothering me since I sent it (along with a couple of paragraphs) to Julia a week or so back. I’ve now fixed it. Also made a couple of small changes around 1901 (when Ruth was born). At this stage, I find the act of editing this to be rather relaxing — in part because all edits are my own judgment, and in part because I think the manuscript is very strong. Am going to follow up with Walter (editor) on Tuesday: he’s had the ms. since the first of the year, and I’d like a verdict. Will send the latest version (I’ve been tweaking it since I sent it) along with my query. 11:05 – 11:15 pm. Proofread this blog. Total time worked today: 9 hours, 30 minutes. Total time worked this week: 62 hours. Tomorrow, please do stop by for “What Do Professors Do All Week?” — in which I reflect on this li’l experiment, answering some of the questions I’ve been asked. The rest of this series: Saturday, Sunday, Monday, Tuesday, Wednesday, Thursday, & What Do Professors Do All Week? (the final post). Congratulations on finishing the week! Can’t wait to read your reflections to tomorrow. Good night! Would love to hear how you do the Molly Bang exercise. Been wanting to do something related to her book for quite a while now and would love to learn how you do it. Geri: I describe the first half of it above. The second half involves people creating a picture that evokes a feeling of comfort. They need to include water in the picture. Mostly, you really need to internalize Molly Bang’s principles, and keep them ever in mind as you work. It’s helpful if you can see her do this exercise, too. For example, they’re not allowed to glue the items to the page because then they can’t be moved. You want to be able to move them — there is, for example, an optimum distance between the chased fish and the pursuing shark. If the shark is too near or too far, then there’s no tension: if too near, the fish is doomed; if too far, the fish will escape. You want them at the point where it’s unclear whether the fish will escape or be eaten. Elena: Thanks! Glad it was helpful!